Strange Culture: Best Actor & Best Actress - Nominee Predictions - No Surprises! Best Actor & Best Actress - Nominee Predictions - No Surprises! These two categories seem written in stone in before the nominations are announced. Of course, there is always room for surprises, but it would seem to me that room is about the distance between "not happening" and "never." The room for surprise seems super limited. The only place I see a "surprise" if if Matt Damon's Informant! character (or as I like to call him, Fatt Damon) were to take the spot of say Jeremy Renner. Otherwise, other possibilities like Daniel Day Lewis, Tobey Maguire or Michael Stuhlbarg, are no possibility at all. The Best Actress race is even more of a sealed case in my mind. I'm sure there are plenty who'd love to see Emily Blunt nominated, but I don't see her stealing Queen Helen's spot. 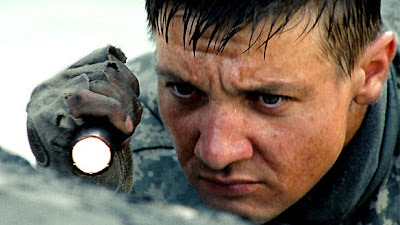 Most at risk to not get nominated: Jeremy Renner (pictured above) for his role in the Hurt Locker. If nominated, his name is certainly thrown in with "some big dogs." Despite minimal wins, his name has come up as a nominee in all the right places, and I think there will be a lot of love for The Hurt Locker come Oscar nomination morning. I admire how out there you are with your nominations. Of course, you are knowledgeable, but that doesn't necessarily lead to confident choices. What surprise are you anticipating? Emily Blunt? Cottilard? Laurent?